failure BEFORE it actually occurs or we run out of budget. Budget versus actual costs. Project ahead of schedule versus project behind schedule. Being told not to worry versus spending sleepless nights worrying. balance in this fast paced, budget conscious 21st century. In a Standish Group study of software projects in both the public and private sectors, nearly 90% of the studied projects failed due to cost and time overruns. In addition, more than 33% were cancelled before they ever came to completion. Nearly one third of the small, medium, and large companies studied experienced cost overruns of 150-200%, with project costs coming in with an average ?overrun of 189% of the original cost estimate. Likewise, time overruns experienced similar difficulties. Over one third of all the companies in the study reported time overruns of 200-300%, with the average overrun being 222% of the original time estimate (Chaos 1995). Failure records like these can be interpreted to mean that project management tools and techniques are not being effectively used and applied. Overall, failed and challenged projects alone cost US companies and government agencies an estimated $145 billion per year. Need a Solution? Earned Value to the Rescue! When faced with a new project, we want it to be successful. We’ve heard all the horror stories about cost overruns, and we want an early warning system to let us know when problems arise before it is too late to resolve the problem. We certainly don’t want history to repeat itself, so we’re in search of a solution that can help. Who Uses Earned Value Management? in the DoD’s financial management orders in 1967. However, the idea has actually been in existence since the 1800’s when industrial engineers wanted a way to measure performance on the factory floor. In August of 1999, Dr. Jack Gansler, USD (A&T), signed a memorandum announcing that the Department of Defense had adopted the ANSI EVMS Standard for use on defense acquisitions. The EVMS guidelines incorporate best business practices for program management systems that have proven to provide strong benefits for program or enterprise planning and control. The processes include integration of program scope, schedule and cost objectives, establishment of a baseline plan for accomplishment of program objectives, and use of earned value techniques for performance measurement during the execution of a program. The system provides a sound basis for problem identification, corrective actions, and management replanning that may be required (Gansler 1999). My actual costs are less than my budget. Is my project doing well, or is it behind schedule? My project’s actual costs are now higher than budgeted, and the project is only halfway complete. What’s it likely to cost at completion? My project manager or engineer keeps telling me not to worry about the cost overruns. The rest of the work will cost less than budgeted. Is this probable? Do I have the necessary staff for this new contract? Will labor rate and currency exchange rate fluctuations affect my project’s costs? How will funding cuts affect my cash flow? Is price or usage causing my cost variance? If you’ve asked yourself these questions, then earned value is a tool you should seriously consider using to determine your project’s health. Earned value is a means of placing a dollar value on project status. This allows you to compare budget versus actual costs versus project status in dollar amounts. Proper analysis of a project requires four major items: budget, earned value, actual costs, and forecasts. All four are needed to obtain a true picture of the project’s health. 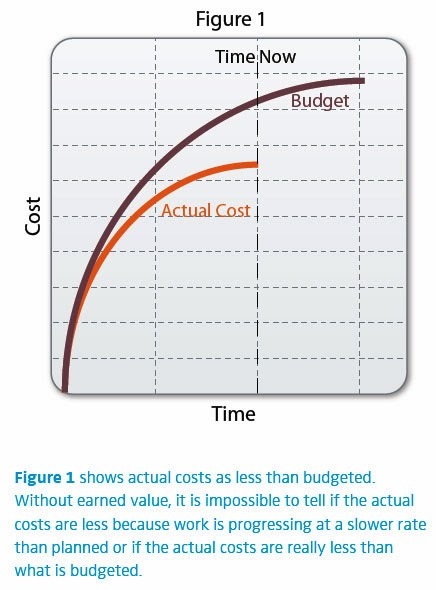 If you analyze only the budget versus actual costs, an incorrect representation often results. For example, if the project spending is 10% under budget, this might appear as if the project is doing very well. However, when the project status or earned value is added to the analysis, it may then show that only half of the originally planned work has been performed. If so, we have a project that is behind schedule, and the completed work costs much more than originally planned! How is Earned Value calculated? Earned value may be defined as the sum of the budgets for the work that is complete. Therefore, earned value for completed activities is equal to the total budget. For activities not yet begun, the earned value is zero. In order to measure the performance of activities in progress, you must come up with a system of measurement that includes objective judgments. The Earned Value Management System (EVMS) guidelines give a number of alternative methods for measuring the earned value of an activity in progress. These methods are often called earned value methodologies or performance measurement techniques (PMT). The basic theory behind all of the methodologies is to multiply the budget by a percentage complete to get the earned value. Most projects contain at least some work that is regarded as inherently immeasurable. An example of this is the work performed by a project manager or a quality control inspector. This type of task is sometimes referred to as “level of effort” since its earned value is assumed to be the same as the amount budgeted. Basically, as long as the task is performed, then the value is earned. My project’s actual costs are now h igher than budgeted, and the p roject is only halfway comp lete. Wh at’s it likely to cost at completion? The most accurate method is to thoroughly reevaluate the remaining work in the schedule to determine a new estimate to-complete for the remaining work. However, this method is often too labor-intensive to be justified. Simply using the remaining budget may be misleading. If project costs to date are higher than budgeted, using the baseline plan from the current time to completion will be misleading as it would represent improved performance. Unless there is an appropriate explanation as to how this improved performance can be achieved, a performance factor should be applied to the remaining work in order to properly project the final cost. The Department of Defense’s experience in more than 400 programs since 1977 indicates that without exception the cumulative cost performance index (CPI) does not significantly improve during the period between the 15% and the 85% of contract performance; in fact, it tends to decline (Beach 1990). Average performance-to-date is calculated by dividing the cumulative earned value by the cumulative actual costs.The resulting value is called the CPI. A CPI that is less than one reflects unfavorable performance. For example, a CPI of 0.85 means that for every dollar being spent, only 0.85 dollars worth of work is being done. Dividing the remaining budget by the CPI of 0.85 provides a cost estimate that reflects a condition where the performance-to-date is assumed to continue to the end of the project. Statistical forecasts (forecasts that are created using such indices as the cost performance index) can give early warning signs of project overruns and can be used to evaluate the accuracy of a manually entered estimate at complete. In fact, results show that the average EAC based on the cumulative CPI was the lower end of the average cost at completion (Christensen 1996). Other common index-based EACs that are found to be higher are more accurate. In particular, studies show EACs based on both the CPI and the schedule performance index (SPI) tend to be significantly higher and are generally more accurate (Christensen 1996). status and past cost performance. A set of optimistic, pessimistic, and most likely forecasts for client reporting. Internal forecasts that are used by the project managers to manage the contract and report internally. These may be the same set as above, or they may be more optimistic as an incentive towards more rigorous management. Several different statistical forecasts to increase confidence in the manually entered forecasts. Multiple forecasts based on the effects of future rate changes. Multiple forecasts facilitate efficient project management because they provide an early warning of probable project overruns. rest of the work will cost less than budgeted. Is this probable? According to some authors, determining the most accurate estimate has never been the objective of the contractor (Fox 1974) (Mayer 1991). Instead, the objective has been to protect the project and the careers of its managers, even if that means understating the projected completion cost (Christensen 1996). Upon reaching the 15% stage of completion, project performance seldom improves. As a matter of fact, after this point is reached, performance seldom exceeds the average performance-to-date and often deteriorates. 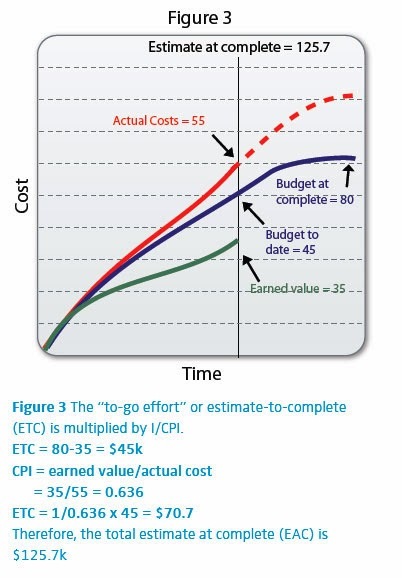 The to complete performance index (TCPI) is the ratio of the remaining work to the remaining cost. It indicates the level of performance that you must achieve to reach a particular estimate at complete. 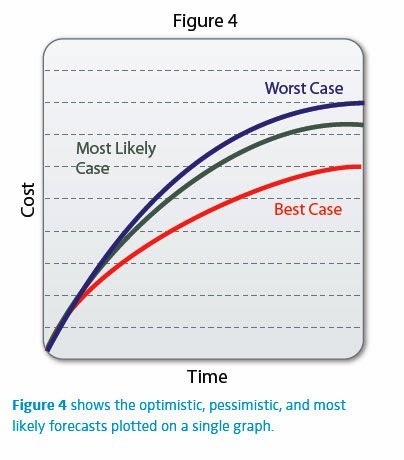 The TCPI will help you examine the probability of the project costs matching a particular forecast. required to meet a particular EAC. The TCPI should be compared to the CPI of the project to date. Since the CPI of a project rarely improves once the project is greater than 20% complete, the TCPI should not be higher than the CPI. A TCPI that is greater than the CPI, shows an improvement in the performance and means that the EAC used in the formula is not probable. Full Time Equivalents (FTE), or equivalent staffing units, are commonly used instead of hours to project staffing requirements. The number of working hours per month should include a productivity factor to determine accurate staffing requirements. The productivity factor will be one if 100% of the working hours are billed to a specific project. On the other hand, if 20% of an employee’s time is spent on non-billable activities like attending meetings and filling out time cards, only 80% of that person’s time is actually spent on the project. In this case, an accurate FTE calculation should include a lower productivity factor. The productivity factor might be different for various personnel, locations, and times of year. For example, a person with both resource management and project management responsibilities often spends a certain amount of time performing human resource activities and may, therefore, have a lower productivity rate. In addition, most countries have holidays during certain times of the year, and people are frequently less productive during those times. Along with productivity factors based on the season and personnel, there are also efficiency factors dependent on past performance that can be applied to the staffing requirement for the remaining work. If the staffing requirements for a project have been overrunning to date, using the baseline plan from the current time to completion implies an expectation that staffing performance will improve. To countermand this expectation, the CPI expressed in hours or FTEs can be applied to the remaining work to predict a more probable staffing requirement for the remainder of the project. When analyzing staffing requirements you need to make sure that all activities, including level of effort activities, are considered. You need to provide for different productivity rates per resource and per month in order to determine an accurate staffing requirement based on the hours required to complete a project. Finally, make sure that your forecasts can be expressed in FTEs to show the projected staffing requirements. Will labor rate and currency exchange rate fluctuations affect my project’s cost? Rate fluctuations will affect the final project cost. You need to make sure that your forecast is not using the same rates used when the baseline was created. Your forecasted rates should change with the economy. This will ensure that your final project costs accurately reflect the current environment. Since cost of living adjustments are difficult to predict, it is helpful to have all rate escalations defined in a single rate set. This way you can define all labor rates as today’s rate and change the labor rate escalation for all resources in a single place. This type of rate analysis can also be beneficial when dealing with currency exchange rates. By using multiple “what-if” scenarios, a good EVM software package can easily and effectively allow you to analyze the effects of all types of challenges presented to today’s project managers. It will allow you to use different sets of rates for each of your forecasts and to calculate foreign currencies as well. With the ability to report on multiple forecasts simultaneously, you will be able to analyze the effects of expected changes by setting up different forecasts using the various labor rates or exchange rates. When analyzing a project, it is important that you are able to compare budget, actual costs, and funding. Today’s competitive market requires that you manage challenges such as funding cuts. If your funding is reduced, your contract may not allow you to change the baseline; however, you will need to modify your spending. If your contract requires you to earn value based on the original baseline – not the funding – you need to copy the budget and globally factor costs using pricing functions. The final outcome is the ability to store and report on both the original baseline and the funding. You can then produce reports that show the baseline, the actual costs, and the funding. 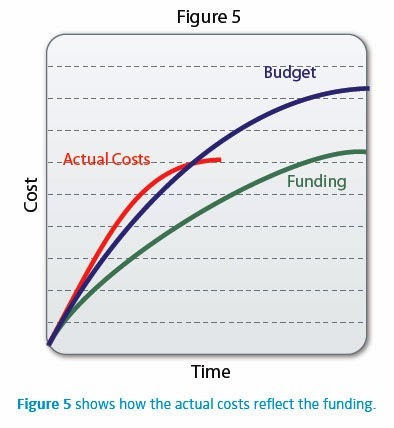 You are trying to make your actual costs and associated funding curves match. What is causing my cost variance? to the actual rate and the budgeted hours to the actual hours. 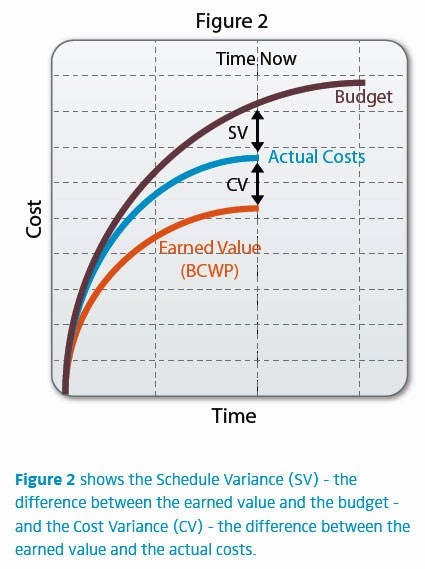 The derived costs associated with earned value are not calculated using a rate file but by earning the budget hours and associated derived costs. Therefore, the earned value rate and the budgeted rate are most likely the same. However, when you examine variances, you should be analyzing earned versus actual as opposed to budgeted versus actual. A positive rate variance indicates that the actual rate is less than the earned rate. Rate variances are compensated for in a forecast by changing the to-go labor rate for your forecast. In addition to rate variance, there is an efficiency variance. An example of an efficiency variance is when you budget and earn 100 hours, but there are 120 actual hours. An efficiency variance is compensated for in a forecast by using statistical forecast methods based on previous performance. Multiplying the remaining effort by 1/(CPI*SPI) is a good means of projecting the final cost. Any time that a cost variance is incurred during a project, it is important to determine what is causing the variance. Is it a rate variance or an efficiency variance? In addition to simply changing the final project cost, the work being performed should be investigated to see if there are any means of improving the situation. Earned value gives you the early warning you need to solve problems while the work is in progress before the actual costs are above the total budget. early warning signs needed to accomplish our goals. Budget versus actual cost is not enough information to properly analyze project performance. Earned value places schedule status in dollar amounts for proper project analysis. It is much easier to compare budgeted dollars to earned dollars than to compare budgeted dollars to a subjective percent complete of the entire project. It is this comparison that gives early warning signs to the project’s health before the actual costs are above the total budget. Therefore, an earned value management software system is the best place to retrieve valuable information needed for reliable analysis of your project’s health. We continue to work at a breakneck pace in order to satisfy our customers and remain competitive. Our companies undoubtedly live and die by the success and failure of the projects we so carefully nurture. By using earned value throughout our projects, we can identify, address, and resolve problems early. This way, we can continue to work towards the improved management of those projects and greater business success as we move through the 21st century. It is a single management control system that provides reliable data. It integrates work, schedule, and cost into a work breakdown structure. The associated database of completed projects is useful for comparative analysis. The cumulative cost performance index (CPI) provides an early warning signal. The schedule performance index provides an early warning signal. The CPI is a predictor of the final cost of the project. EVMS uses an index-based method to forecast the final cost of the project. The “to-complete” performance index allows evaluation of the forecasted final cost. The periodic (e.g. weekly or monthly) CPI is a benchmark. The “management by exception” principle can reduce information overload. Does this software integrate with my scheduling software? Does this software support multiple performance measurement techniques that allow me to objectively measure performance on my activities? Is there a clear distinction between a baseline and a forecast in the system? Can I maintain and report on multiple, time phased forecasts? Can each forecast use a separate set of rates to perform “what-if” analysis? Can I calculate foreign currencies? Can rate escalation be stored separately from the base rate, and can it be adjusted for all resources in a single place? Does this software calculate statistical forecasts based on past performance? Does this software support different productivity rates per resource and per month when calculating FTE? Does this software calculate forecasted FTE based on past performance? Does this software allow me to enter and report on funding? Does this software contain pricing functions that allow me to globally adjust costs? Are earned and actual hours stored in the system in a manner that allows me to calculate price and usage variances? Is the result of the earned value calculations stored time-phased? This will keep my earned value in previous periods from changing if the budget changes. Beach, Jr., Chester Paul. A-12 Administrative Inquiry. Report to the Secretary of the Navy. Washington DC: Department of the Navy, 1990. Chaos. The Standish Group International, 1995. Christensen, David S., Ph.D. “The Cost and Benefits of the Earned Value Management Process.” <http://www.dau.mil/pubs/arq/98arq/chrisevm.pdf> (Fall 1998). Christensen, David S., Ph.D. “Cost Overrun Optimism – Fact or Fiction?” Acquisition Review Quarterly March 1993. Christensen, David S., Ph.D. Project Advocacy and the Estimate at Completion Problem. Journal of Cost Analysis Spring 1996. Cooley, Kevin. Project Management: Why Do We Need It and What is It? Stamford, CT: META Consulting Group, Inc., 2000. Fox, J. Roldan. Arming America: How the US Buys Weapons. Boston, Mass: Harvard University, 1974. Gansler, Jack. “New ANSI Standard on EVMS Guidelines, ANSI/EIA-748-1998, Published.” <http://www.acq.osd.mil/pm/newpolicy/indus/ansi_announce.html> (17 October 1999). Mayer, Kenneth R. The Political Economy of Defense Contracting. New Haven, CT: Yale University, 1991.